Glimmer’s fast components can be used outside of Ember but could also provide an easy way to gradually pick up the framework. There’s a great intro video. A fun journey into the world of fractals, starting from an empty canvas and going through the math and logic involved in rendering a Mandlebrot set of your own. 4.0.0 (‘invisible-makeover’) is here. Backwards compatible with Angular 2 and most apps will port straight over unless they use animations. Also learn why it's 4.0 and not 3.0. 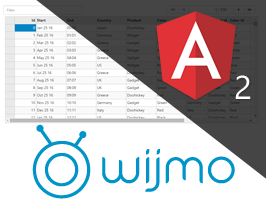 Find out how Wijmo’s advanced UI components can help you to create an Angular application quickly and efficiently – we take you through step-by-step. Some straightforward examples of using ES2016's async/await vs promises. async/await are natively supported in Node 7.6, as well as via Babel. Iterators can be written using generators which can lead to an interesting use case. Elegant and well documented, with many examples on the homepage. No dependencies. Over in Node Weekly we covered Next.js 2.0, a look back at left-pad, and what 'const' stands for in ES6. Compares creating and registering services in Angular 1.x vs 2+. A look at how framework command-line interfaces compare to each other. Similar to Select2 and Selectize but without the jQuery dependency.